Customers hate surveys, but want to give feedback. Add our 1-click buttons to your Outlook email signatures in minutes. Customers = happy. You = happy. 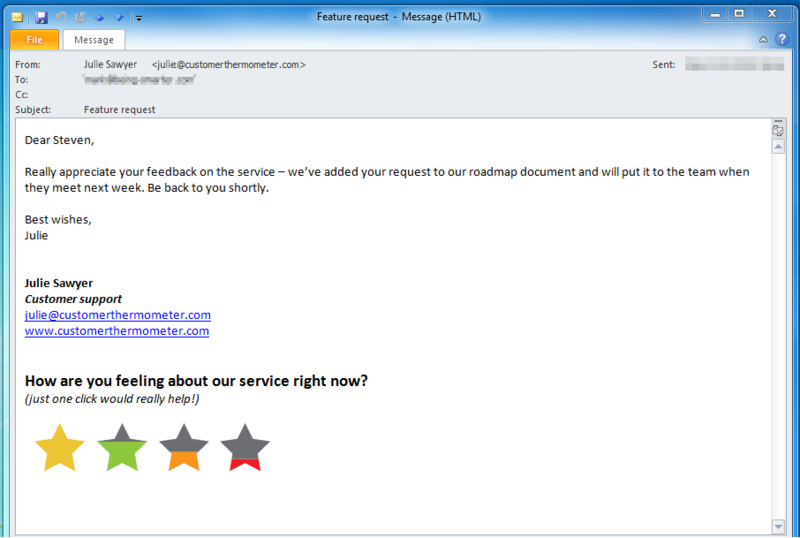 Recipients receive an email, containing 1-click feedback buttons. They respond with a click (or tap) to give their rating and leave a comment if they wish. Customer feedback appears immediately on your dashboard whilst a picture of your teams builds up. Your customers hate multi-question surveys. Here’s a better way. Customize the landing page with your own logo and wording and capture comments. View all comments your customers have made. Check them out in our word cloud too. Where does Exclaimer fit in? By using Exclaimer’s Exchange or Office365 services, signatures are stamped onto the email, when they pass through the sending server. 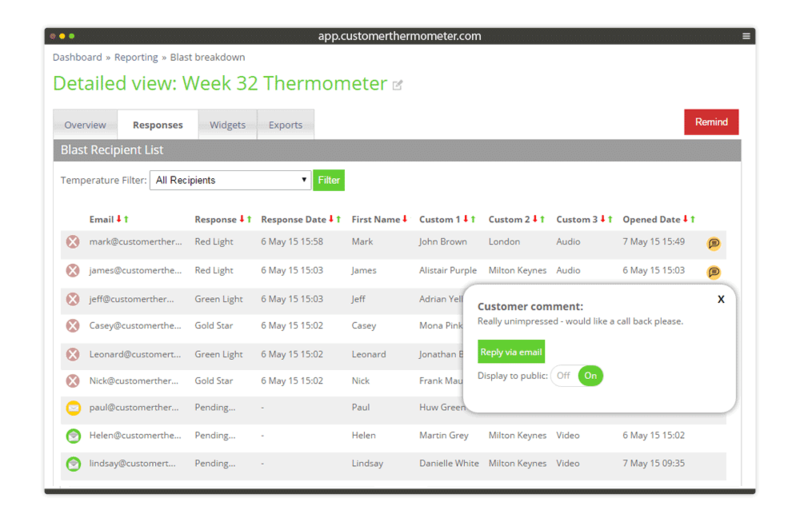 This means you can receive identifiable responses from your signatures within your Customer Thermometer reporting. Here’s an example 1-click email survey. Setup rules within Exclaimer to determine which user sends which Thermometer signature. (You may choose not to use internally for example). Ask any one question – again – this could be set according to Exclaimer rules – the Sales dept might ask a different question to the Service dept. Use any icons you wish. Clicks or taps by a recipient will identify them by email address within your Customer Thermometer reporting. We’re seeing well over a 10-fold improvement in response rate since moving our feedback tool. You’ll never stop every mistake from happening. But now you can fix it when it does. Giving you have the power to fix customer issues in a flash. Long surveys get terrible response rates in today’s mobile and visual world. 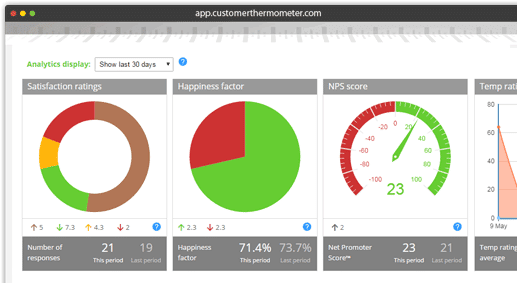 Add Customer Thermometer into your Exclaimer footer today. Your customers really want to give you feedback. But often their only way to do so is an arduous survey. When your recipient has fed back, you’ll see their rating and comment instantly in the reporting area. You can even be alerted to responses in real time. Takes seconds to answer. Responsive and mobile-friendly. No wonder our response rates are ripping up industry averages. Thermometer to your Exclaimer setup? Want to see all of our features? Click the button to check out our features page and be inspired by a new way of collecting feedback. Or, just try us out. Your first 10 surveys are on us.